Food brings people together but, in the case of those with coeliac disease, it can set people apart. Goodbye Gluten bridges the gap with tasty, regular food that can be enjoyed by everybody. The secret of its success lies in the flour mix around which the recipes are based. Commercial gluten-free flours can vary greatly, yielding different results. Made from inexpensive, easy-to-source ingredients, the flour mix recipe used in Goodbye Gluten will work successfully every time when used for the recipes in this book. All 90 recipes have been tested multiple times for taste and consistency, with author Sally Holland mastering favourites that are notoriously difficult to perfect without wheat flour, including shortbread, sponge cake and pastry. Christmas and children’s birthday parties – occasions that can be challenging when you have a coeliac at the table - are given their own dedicated chapters. 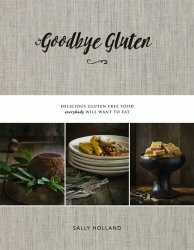 Goodbye Gluten is a must-have for anyone wanting to exclude gluten from their diet, be it for medical reasons or by choice. 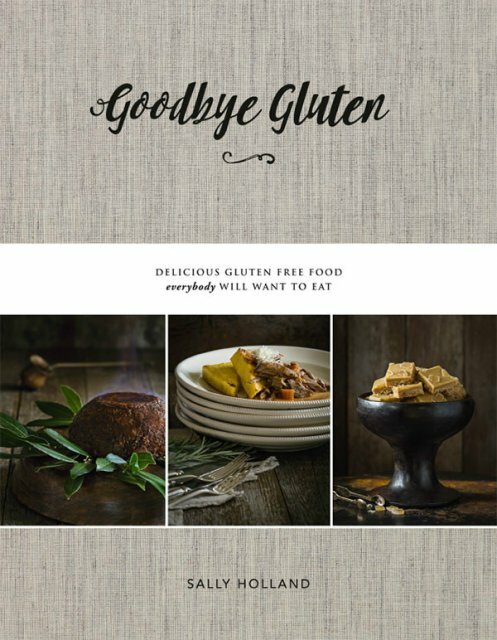 Goodbye Gluten is a gorgeously illustrated book with 90 recipes for a broad range of occasions including Christmas and children's parties. The book is bound in a sturdy hardcover. The recipes within are easy to follow and work well.